Kirsty’s book is loose – catch it quick! Never Never Never Come Back is out now from Salt Publishing! Available initially in a limited hardback run, with gorgeous hotfoiling under a dust jacket featuring artwork by the very talented Matt Latchford. Don’t go over the hill, or look too long into the well, or go carousing with strangers, or you’ll never never never come back. With the haunting quality of nursery rhymes but the complexity of a dark and smoky wine, these poems brood on absence and abandonment, outcasts and anomalies, monstrosity and mistakes. At the heart of the collection are a suite of tightly focused, often impressionistic character studies ranging from cannibals to schoolgirls, but Irving also finds space in the shadows for desperate love songs to pilots and robots, satiric odes to tyrants and deft engagements with popular and literary culture. Whether turning the features of a pinball table into an emotional debris field or recounting unnerving sexual encounters, these are rich and rangy poems of a defiantly unusual character that linger in the mind as much for their controlled dissonances as their uncompromising subject matter. Huge thanks to Salt Publishing’s Chris Hamilton-Emery and my editor Roddy Lumsden. I could not be more stoked. For review copies, please contact me on kirsten.irving@gmail.com. 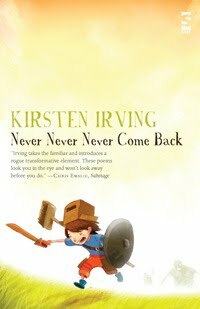 Author Kirsten IrvingPosted on October 20, 2012 October 11, 2016 Categories Kirsten Irving, Matt Latchford, Never Never Never Come Back, poems, poetry, robots, Roddy Lumsden, Salt PublishingLeave a comment on Kirsty’s book is loose – catch it quick!